The last few weeks has been marked by a slight marshmallow obsession and the daily scoffing of these little squares of fluffy delight. I used to love marshmallows as a kid and especially loved the game fluffy bunnies which involved stuffing as many in the mouth at once whilst still saying fluffy bunnies (youth workers will know what I am talking about) and they were one of the only sweetie type things I actually like (I am mainly all about chocolate and cake). Good source of protein. I use it as a bit of a natural protein powder in my smoothies and it great of building muscle and repair. Aid digestion. Gelatine binds to water very easily therefore making bowels smoother and happier. Healing agent. It is a great healing food for those with any digestive or auto immune issues going on. Source of collagen. So it is great for tightening skin, help remove cellulite and also for hair and nails too. Aids sleep. Gelatine contains amino acid glycine which is “an inhibitory neurotransmitter, which can decrease anxiety and promote mental calmness” (source) and this study shows some measurable improvement of sleep when gelatine is consumed. Great for joints. 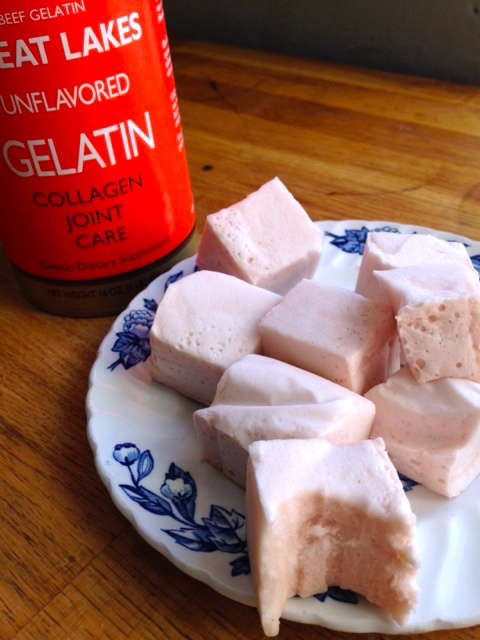 I have been having some issues with my joints recently which is why I am upping my gelatine game. It is anti inflammatory and help protect and strengthen the bones as this study shows when used with athletes it improved joint pain. So as you can see there are many benefits to good old gelatine but as with nearly everything I say here it is really good to buy top quality stuff . I buy Great Lakes as they are the only brand that can assure the animal have been pasture raised and basically had a normal life which means the gelatine is more nutrient dense. Its pricey but it lasts you for ages and a little goes a long way. 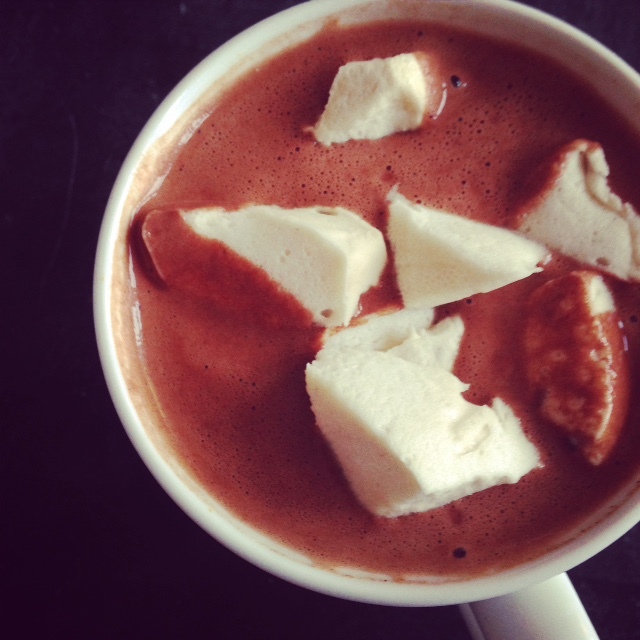 But back to the main topic at hand – marshmallows. Which are awesome and should be eaten often. What was your favourite sweet growing up? Have you ever used gelatine before? 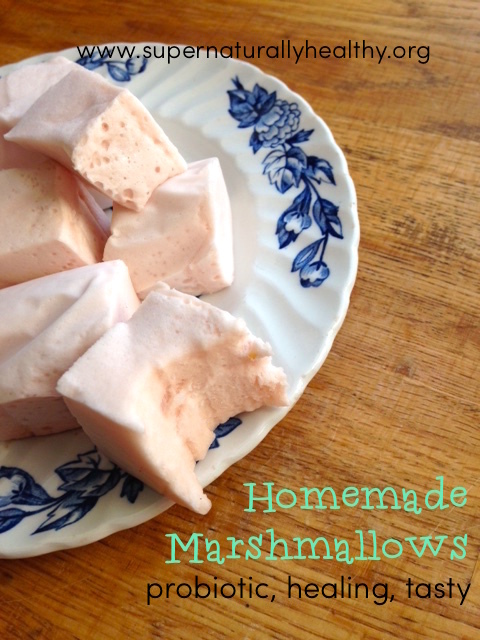 Simple probiotic marshmallows to heal your gut and are sugar, gluten, grain and junk free! GAPS SCD AIP approved! In a bowl mix the gelatin with 250ml of water and mix and then put aside (it will go hard). Then in a pan heat up the remaining honey and water until it simmers. Then simmer and stir regualrly for about 7 minutes or until it gets to about 110c if you have a sugar thermometer. Then pour into a grease proof papered glass dish and leave to set in the fridge, then simply chop into desire size/shapes.